A car used by the greatest Briton* – Sir Winston Churchill – is set for auction at arguably the greatest British auction venue – Brooklands – when Historics hosts its third sale at its permanent home on Saturday, December 4th. Featuring the finest coachwork by the Carlton Carriage Co., the Daimler DB18 Drophead Coupé was used by the British Prime Minister during 1944 and 1949 election campaigns and is expected to fetch offers in the region of £200,000 to £250,000. 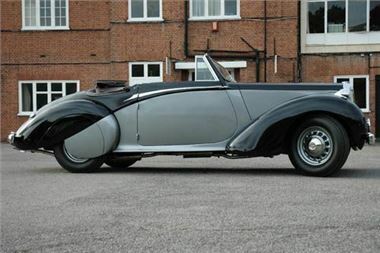 Owing to the second world war, only eight of the proposed 23 DB18 Drophead Coupés due for 1939 were built, with four completely destroyed during the Blitz, a fifth so badly damaged it was scrapped and the whereabouts of two unknown, Chassis 49531 remains the only discovered surviving 1939 model. Rolling off the production line in the same year motor racing ceased at Brooklands, the DB18 was capable of a top speed of 76 mph and a 0 – 50 mph acceleration time of a none-too-shabby 17.9 seconds. Although technically speaking the DB18 utilises manual transmission, the car actually makes use of a 4 speed Wilson Pre-selector gearbox in tandem with the Daimler Fluid Flywheel, which allows the driver to select the next available gear by hand before using the ‘change pedal’ to enact the shift. With its extensive history well documented, including ownership in the U.S.A, Germany, UK and even by an Iranian Prince, this eminently intriguing motorcar has benefited from a painstaking c €140,000 top-to-bottom restoration by the revered restorer, E. Thiesen of Hamburg, Germany. Finished in stately silver over black coachwork with a contrasting three-position cabriolet hood, the striking exterior is complimented by a luxurious green leather bench seat in the front and sideways seat in the rear, whilst an elegant wooden dashboard houses period black Jaeger instruments. The car will be on display at the Brooklands Museum until the sale on Saturday December 4th, and for more information, or to attend the Historics at Brooklands auction on the afternoon of December 4th, call 0800 988 3838, e-mail: auctions@historics.co.uk, or see the website, www.historics.co.uk. Entry by catalogue only, available prior to, or on the day of the auction.